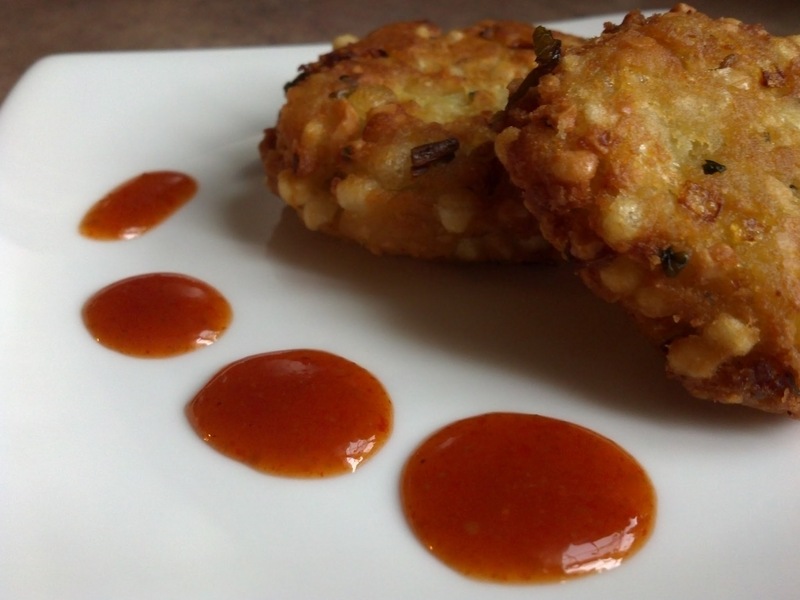 Here’s my take on the traditional sabudhana vada/javvarisi vadai, only with taro root instead of potatoes. These are a bit heavier than the traditional recipe due to the consistency of the taro root, but nice and crunchy on the outside and smooth and soft on the inside. We’re pan frying instead of deep frying, so we’ll save a bit on oil and oil calories, and oil splashing and other oil-related accidents. 1. Mix all of the ingredients except the oil in a bowl. If the mixture feels too wet, add a little extra rice flour to bring it together. Form 2-inch wide and 3/4-inch thick patties. 2. In a deep frying pan, heat 1/4 inch deep oil until a drop of water splutters when it hits the surface. Reduce heat to medium. Working in batches, fry the patties until golden brown on each side (about 5 minutes per side). Remove to a plate covered with paper towels to absorb excess oil. Pat the tops with a paper towel to pick up more oil. Serve warm with the chutney or hot sauce of your choosing, or just eat them plain. 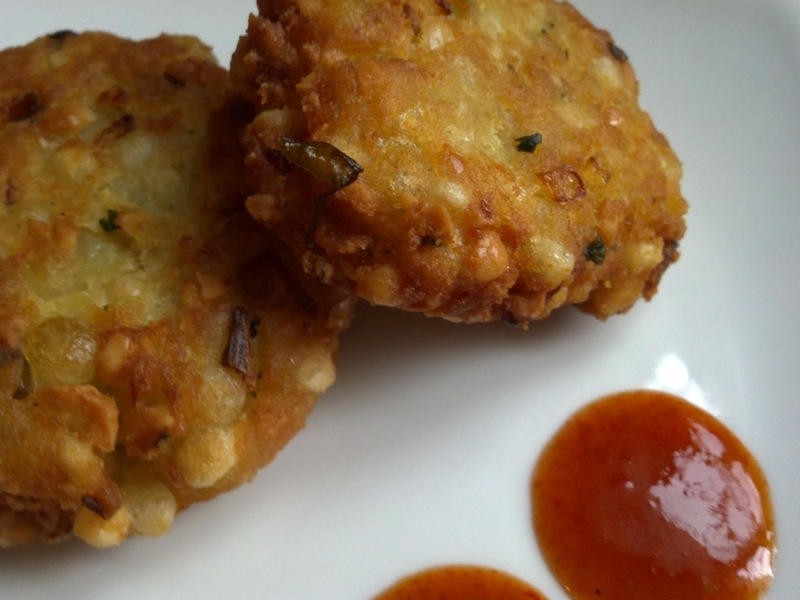 Vadai are, in a nutshell, fritters. They can be plain dough or they can have other ingredients mixed in. The dough can be made of flour, lentils, potatoes, tapioca, and so on. 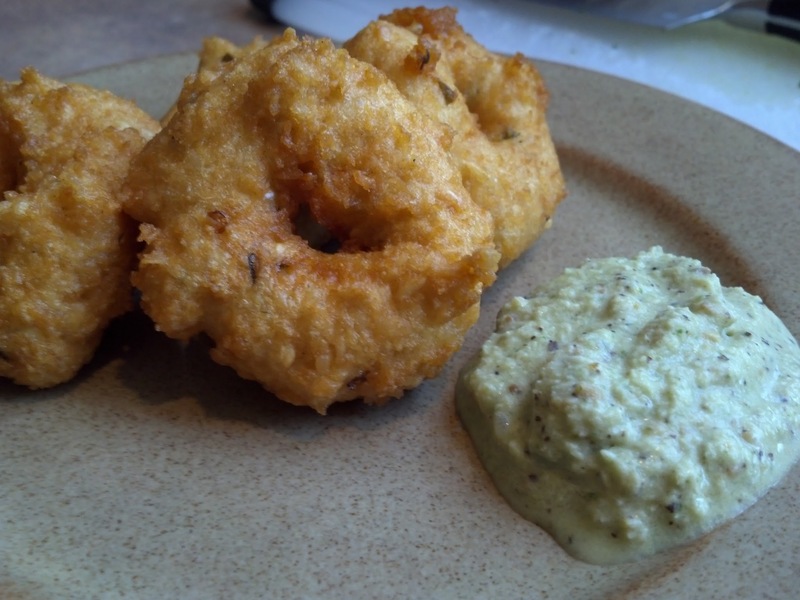 These vadai are made with urad dhal (ulutham paruppu) and served with coconut chutney. 1. Soak the urad dhal in water for at least 4 or 5 hours. 2. Start heating the oil (at least 3 inches deep) in a deep vessel. 3. While the oil is heating, drain off the excess water from the soaking urad dhal. Add salt and grind to a rough paste using an immersion blender or grind in a regular blender. Do not add too much water. Mix in the coconut, green chillies and curry leaves. 4. Keep a little oil next to you in a small bowl. Spread a little oil on your palms, take about 2 tbsp of vadai batter in your hand and make it into a round disc shape. Use your finger to make a small hole in the center (so it looks like a mini doughnut) and slide it carefully into the hot oil. Fry in batches until the exteriors are golden brown and crispy, flipping as needed to fry both sides. 5. Remove to a paper towel to drain some of the excess oil. Serve hot with chutney, sambar or plain.